Forza Horizon 4 will feature narrative gameplay for the first time in the history of the series. Yes, there will be a story to accompany all the tyre screeching and wax polishing of your shiny cars. While previous Forza Horizon games have featured basically no storytelling at all, focusing on the cars themselves rather than the people driving them, Forza Horizon 4 will break the mould by adding, among other features, a mode styled after Crazy Taxi. In an interview at E3, Benjamin Penrose, studio art director at developer Playground Games, introduced a new feature being added to the series for the first time – a narrative mode called Horizon Stories. Check out our list of the best racing games on PC. Those narratives will be centered around the businesses you can own in Forza Horizon 4, and one of those is a taxi company. 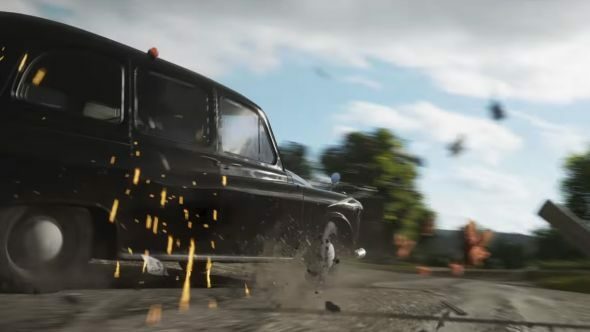 Forza Horizon 4 is set in Britain, and London’s famous black cabs featured in the game’s E3 trailer, so I’m hoping we get to go careening around the picturesque countryside in one of those. A taxi driver won’t be the only job you can hold down, as Penrose says “you’ll also be able to be a stunt driver” in another Horizon story, which he says are based on “the narratives that are associated with other racing games.” Somewhere along the line, that includes letting you focus your efforts on being a painter, meaning you can beat Forza Horizon 4 without ever leaving the garage. Forza Horizon 4 is out this year, and you can check out a trailer above (keep your eyes peeled for the black cab).